Military aircraft: The B-17 Liberty Belle is the flagship for Liberty Foundation, a not-for-profit 501c3 organization whose purpose is to give history a future by honoring our veterans, educating our youth and preserving our aviation heritage. Don Brooks father, Elton D. Brooks, flew in the 390th BG as a tail gunner in the original B-17 Liberty Belle during WWII. His 39 missions that took him over the beaches of Normandy on D-Day through the fall of Berlin in 1944 inspired Don to restore a B-17 not only in his honor but to honor all the veterans who served. 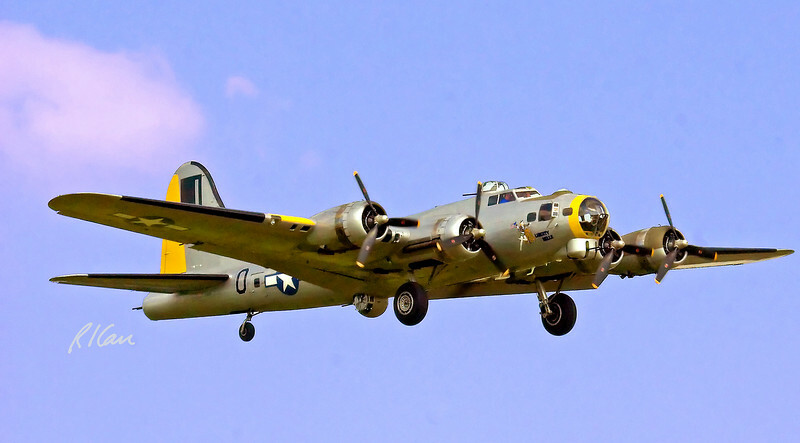 The Liberty Foundation ( http://www.libertyfoundation.org) is making plans for its National Tour of the 14th Flying Fortress to grace the skies. (Words by Kathryn (KT) Budde-Jones). Thunder Over Michigan, Yankee Air Force, Willow Run Airport, Ypsilanti, Michigan, August 2005.